I've never been a huge fan of tea in general, but I've started getting into it over the past year or so. 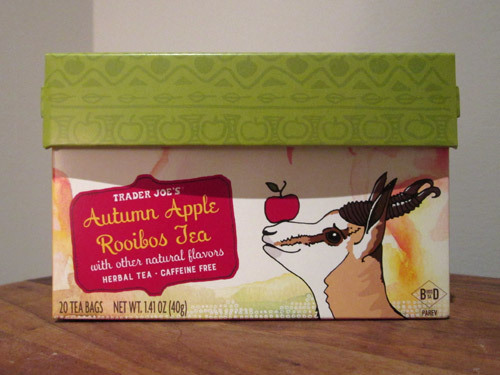 Since then I've tried several Trader Joe's teas, and the results have been hit or miss. Some of them I loved, but just as many I hated. This one goes in the hate category. I was really expecting to love this, given that I generally like anything that's apple flavored, but it was awful (at least in my opinion). I made this using the same triple brew method that I've used before so it's ultra-concentrated to get more flavor, but it still just tasted like nothing. Unfortunately I only discovered my intense hatred for this tea after brewing about 2 liters of it, so I tried my best to salvage it. I usually add a little bit of sugar to tea, but this actually made it even worse. One time I tried adding apple juice, which made it slightly better, but still not great. What did make it taste pretty good though, was adding some Unfiltered Trader Joe's Honey Crisp Apple Cider to it. That being said, I'd rather just drink the cider by itself. But I guess if you're wanting to cut back on the amount of sugar and calories in cider, but still get some good apple-y flavor, then doing the Apple Tea and Apple Cider combo might be a good fit for you. It's not a great fit for me, though, and the remaining 12 or so tea bags will be going in the trash. Why bother wasting my time with this when I could be drinking Pumpkin Spice tea instead?